Nasopharyngeal fibroma also known as juvenile nasopharyngeal angiofibroma is a rare tumour, though it is the commonest of all benign tumours of nasopharynx. Its exact cause is unknown and thought to be testosterone dependent. Earlier site of origin and growth of this tumor was thought to arise from the roof of nasopharynx. Patient present clinical features of profuse, recurrent and spontaneous epistaxis. Tumour is seen almost exclusively in males. Other benign tumours of nasopharynx include pleomorphic adenoma, chordoma, hamartoma, choristoma, paraganglioma. Nasopharyngeal cancer is a multifactorial disease. The exact aetiology is not known but genetic, viral, and environmental factors are responsible. WHO classified epithelial growths into three types, based on histopathology i.e. type I, type II, and type III. All the three types are squamous cell carcinoma. Special stains for epithelial and lymphoid markers are required to differentiate them from lymphomas. Foramen lacerum and foramen ovale provide direct route of spread to middle cranial fossa causing diplopia or ophthalmoplegia. 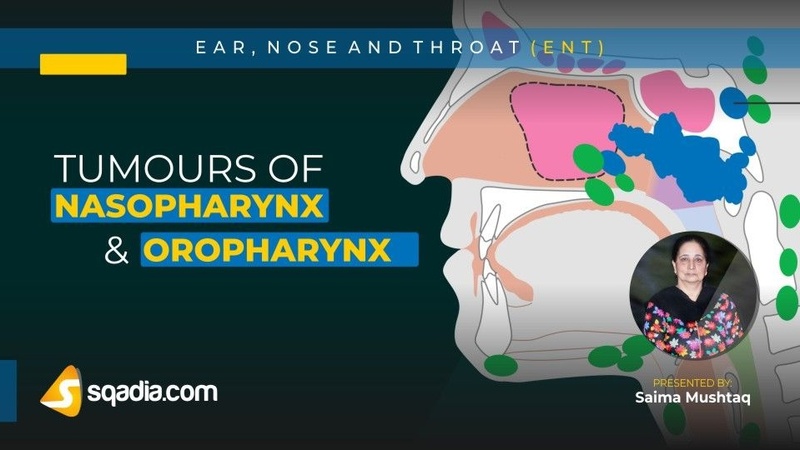 Nasopharynx is rich in lymphatics and an early lymphatic spread is seen in cervical nodes. Clinically, nasal obstruction, nasal discharge, and epistaxis is seen in patients of nasopharyngeal cancer. Also, Due to obstruction of eustachian tube, there is conductive hearing loss, serous or suppurative otitis media. High- resolution, contrast-enhanced CT of neck and nasopharynx is the study of choice to diagnose the cancer. Biopsy can also be done for diagnosis. WHO classified nasopharyngeal carcinoma into three types. These types have also been correlated to titres of EB virus and also in their response to radiotherapy. Stage I and II are treated by radiotherapy alone while stage III and IV require concomitant radiation and chemotherapy. 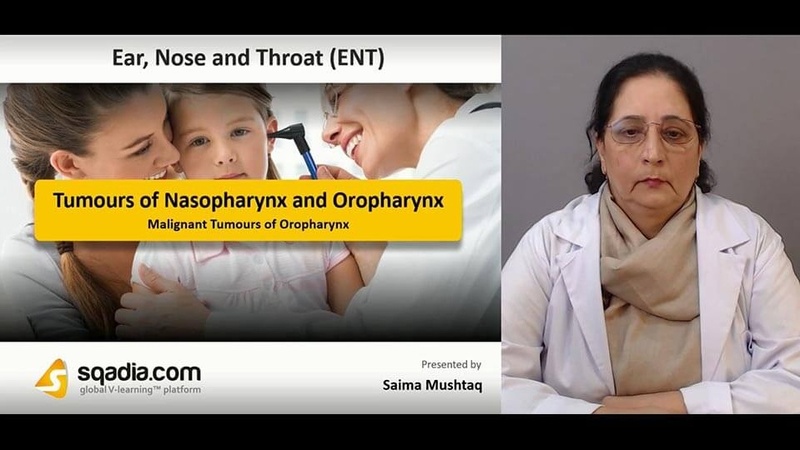 Benign tumours of oropharynx are far less common compared to malignant tumours. Papilloma pedunculated, arises from the tonsil, soft palate or faucial pillars. Haemangioma can occur on the palate, tonsil, posterior and lateral pharyngeal wall. Pleomorphic adenoma is mostly seen submucosally on the hard or soft palate. Mucous cyst is usually seen in the vallecula. It is yellow in appearance. Gross appearances of malignant tumour can be divided into four types i.e. superficially spreading, exophytic, ulcerative, and infiltrative. Carcinoma of posterior one-third or base of tongue remains asymptomatic for a long time and patient presents when metastases in cervical nodes make their appearance. Carcinoma tonsil and tonsillar fossa is the most common and presents as an ulcerated lesion with necrotic base. Carcinoma of faucial arch is superficially spreading and well-differentiated with late tendency for nodal metastases. Carcinoma of posterior and lateral pharyngeal wall remain asymptomatic for a long time. It is treated by irradiation or surgical excision of growth with skin grafting. Parapharyngeal tumours cause a bulge in lateral pharyngeal wall of oropharynx and distort the pillars and soft palate. Styalgia also known as eagle syndrome is due to elongated styloid process or calcification of stylohyoid ligament.